The process of putting together a guide can vary as much as the contributors themselves. While Huijboom likes to write the guide while playing the game for the first time, Summers uses the first play-through to build an outline and then take more detailed notes with a section-by-section breakdown the second time through. Once the notes on playing are complete, there's the layout process which is not too dissimilar to a print publication. Writers add the table of contents and section headings, as well as any artwork to go with the guide. (Despite the multimedia bent of the web, the majority of writers still prefer barebones text files with the ASCII art.) To save time, most long-time guide authors keep templates for this purpose. Finally, writers post the guide for public consumption and edit them based on feedback. Many players will send in their own strategies to authors or are very quick to point out errors that need to be corrected. The entire process can take between 50 hours to several weeks according to several writers. While that time and effort is mostly unpaid, there are a few ways FAQ writers can receive compensation for their efforts. Many authors put a PayPal donation link in their guides, while larger FAQ hosting sites frequently put contributors in a draw for Amazon gift certificates, among other prizes. Writing a good guide can also serve as a portfolio piece to get paid work. Both Huijboom and Engel have taken on freelance assignments to write guides for professional sites. "It's like a part-time job," says Huijboom. Huijboom's portfolio includes one mammoth piece: his Final Fantasy VII guide, which was his attempt to put together every piece of information that could possibly be found about the game. Like other projects, it was motivated by what he felt was a "really horrible" official guide. "It's really astonishing that they put out such a really, really bad official guide on the market," says Huijboom. Almost 900 pages later, he felt he'd filled the gap in FFVII knowledge. "It really satisfied me to create such a document for my favorite game," he says. This body of work, along with the freelance work he performed, led Hujiboom to a rare opportunity: He was recently contracted by game guide publisher Piggyback Interactive to contribute to the publisher's officially licensed Final Fantasy XIII guide. On the other hand, even with paid work available, some authors prefer to keep FAQ writing as a hobby. Summers has turned down paid assignments, fearing it would take away from his writing. 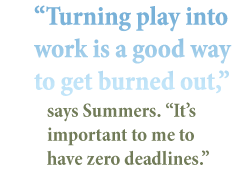 "Turning play into work is a good way to get burned out," says Summers. "It's important to me to have zero deadlines." As with any community, FAQ writers have different motivations and work styles, but their end goal is the same: providing solid information to help out fellow gamers. Whether it's documenting the locations of every hidden package in a game, figuring out how to defeat that pesky fifth boss or determining which order the soup cans need to be placed in to open the door, somebody is probably working out the solution and ready to post it online. "These guys do it without complaining or compensation," says Summers. "[They're] really just a stellar assortment of authors." Robert Janelle is a freelancer from Ottawa, Canada. His blog can be found at waa.loudandskittish.com.